R.F. Kristi, the author of the Inca book series is a former professional of the United Nations Children’s Fund. She has traveled and lived in various countries of the globe. With a deep commitment to animal rescue eﬀorts, Kristi has a keen interest and love for animals. She created the Inca Cat book series for younger readers up to age 8 or 12 and also animal lovers. Vampires at Easter, Diary of a Snoopy Cat by R.F. Kristi contains characters from hamsters to vampire bats. Inca, the main character and voice of the story, is a cat who belongs to a cheese shop owner and runs an all-animal detective agency. Inca and her cat friends, Cara and Fromage, together with other friends, including their hamster friend, Charlotte, are off on a great adventure in Transylvania. Their human, Missy, is hired to cater a scary-theme party in Bran Castle, which is known for being Dracula’s home. Everyone travels to Transylvania and begins preparations for the party. After solving one mystery about missing cheese, the friends get involved in a much more sinister and frightening case involving vampires, bats, secret towers and magic potions. Children will love to read about Inca and her fellow detective friends in Vampires at Easter by R.F. Kristi. Each of the animal characters has a distinct and interesting personality that brings something to this imaginative story. Readers can identify with any number of these characters. The illustrations by Jorge Valle add tremendously to the book's delightful presentation. I enjoyed imagining a cat writing the story down in a journal and the relationships between humans and animals are fun and even accurate in some respects. 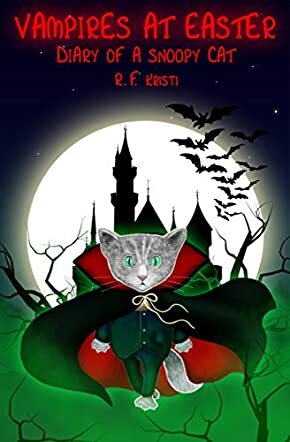 Kristi’s mixing of clothing-wearing, self-assured cats with bats and vampires in a castle in Transylvania is imagination genius. The book is perfect for young readers who like animal characters and also to be just a little bit frightened. Vampires at Easter, Diary of a Snoopy Cat: Inca Book Series, #6 is an animal adventure book for children and preteens written by R.F. Kristi and illustrated by Jorge Valle. There were only 14 days until Easter, and Inca, Fromage and Cara wondered why their mom was so excited about a place called Transylvania. They soon learned that it was a region in Europe, and that their mom would be hosting a special party for a client in Bran Castle there, which was also reputed to be Dracula’s castle. It would be a grand party with lots of guests, and everyone in the Inca & Company Detecting Agency would be coming along. No one particularly enjoyed the trip to the airport, and they liked the plane trip even less, but soon they were travelling on to their destination. The castle was huge and a bit scary, but Inca got really spooked when she noticed that there was a cemetery outside their bedroom window. The detectives had a minor mystery to solve as soon as they got there -- someone had been pilfering the most delicious French cheeses that their mom had ordered for the party. This news especially concerned Fromage. If anyone was to pilfer cheese, it would be him. They soon discovered the identity of the real culprit, however, and the agency got involved in helping two new friends with a very important mission. R.F. Kristi’s animal adventure book for children and preteens, Vampires at Easter, Diary of a Snoopy Cat: Inca Book Series, #6, is guaranteed to delight anyone who is fortunate enough to have animal companions in their families or as friends. Inca and her detecting agency cohorts are marvelous fun to follow as they learn about their new surroundings and find opportunities to get involved. In this book, they end up in Dracula’s castle, and their adventures in the gloomy old structure are everything Inca Book Series followers have come to expect from this remarkable series -- and more. I particularly like the way Kristi has endowed each of these animals with distinct personalities and modes of interacting with others, and Jorge Valle’s disarming and humorous illustrations capture them perfectly. Fans of the old Hammer Dracula films will also have a ball following Inca and her companions as they navigate Dracula's castle. From the moment that spooky housekeeper dressed in black opens the door, you just know you’re in for a lot of spooky fun. Vampires at Easter, Diary of a Snoopy Cat: Inca Book Series, #6 is most highly recommended.